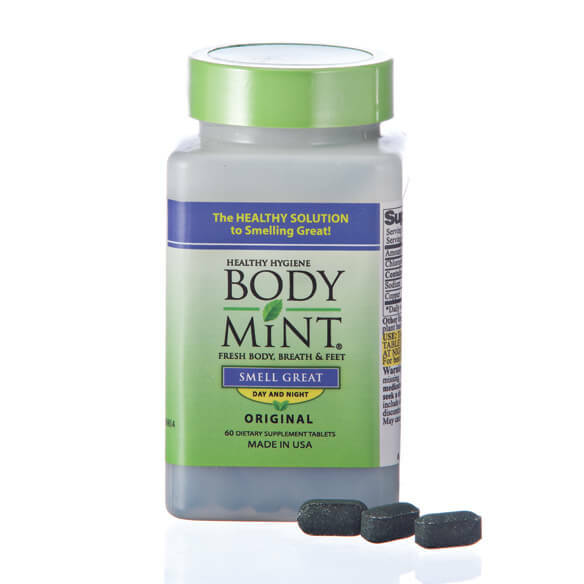 Reduce or eliminate breath, underarm, feminine, and foot odors easily—just take this Body Mint® body odor pill twice a day for results in 2 to 4 days! The active ingredient chlorophyllin (100 mg per tablet) does the trick. 60 tablets. 30-day supply. We apologize for any inconvenience; however, this item is not available for delivery to Canada. Sodium copper chlorophyllin, cellulose, dicalcium phosphate, stearic acid. GLUTEN FREE. Swallow one pill with liquid in the morning and one pill in the evening for day and night odor prevention. Dosage may vary by individual need. The pill may be taken with or without food. Body Mint has a cleansing effect and we recommend that you drink 4-6 glasses of water per day. At last a product that actually does what it promises. Alittle expensive, but you get results. Im satisfied with this product, it really works! I chose this from an advertisement because i sweat and very busy yet dont get enough excercise nor supplements & o want to stay fresh so i don't have that funky nervous sweat odor. Breath yep. Feet no. What are the ingredients? Will they interfere with coumadin or methotrexate? BEST ANSWER: Thank you for your question. The ingredients are Dicalcium Phosphate, Cellulose, Stearic Acid. We hope this information will be of help to you.